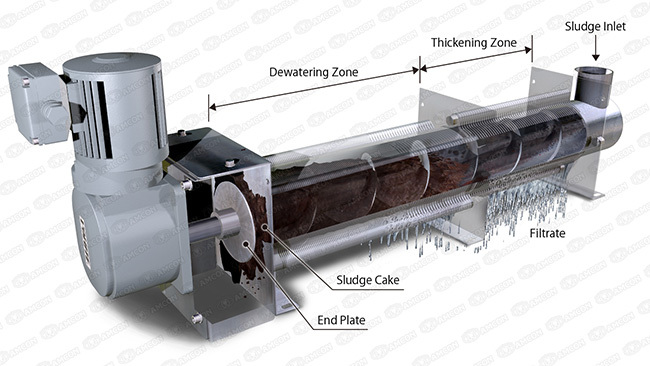 Volute Technology | AMCON is the solution for sludge dewatering press and treatment. In 1991, AMCON brought VOLUTETM into the world where nobody had ever seen such a unique filter element. Before VOLUTETM was developed, AMCON’s previous experience as an operator of sludge dewatering equipments and wastewater treatment plants urged us to develop a user-friendly machine. After 10 years, we completed the development of VOLUTETM technology, the filter elements with multiple layered Rings. The mindset of the founder of AMCON has been carried over by AMCON engineers, and continuous efforts for development and improvement of the technology are being made to make the facilities more user-friendly and convenient. 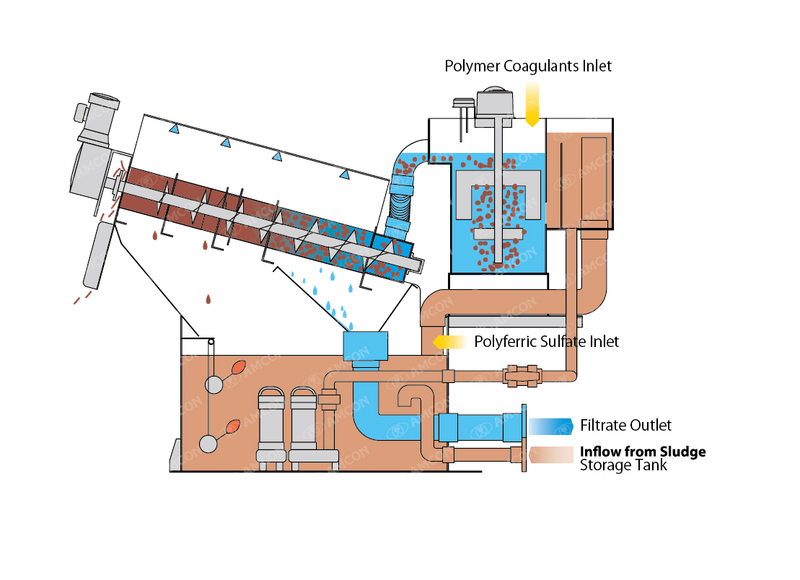 * All AMCON sludge dewatering presses and thickeners come equipped with VOLUTETM technology. VOLUTETM is structured with a filter element that consists of two types of Rings: a Fixed Ring and a Moving Ring; and a screw that thrusts the filter element and transfers and pressurizes the sludge. The gaps between the Rings and the screw pitch are designed to gradually get narrower towards the direction of sludge cake outlet and the inner pressure of the filter element increases due to the volume compression effect, which thickens and dewaters the sludge. According to customer requirements, two types of main body configurations (with/without sludge conditioning tank) are available. For the model without a sludge conditioning tank, an affordable price was realized by eliminating the tank. In addition, it is designed to secure the solid capture rate as high as 90% or higher. The performance is as sufficient as it needs to be. A sludge conditioning tank temporarily stores sludge before it is dewatered. 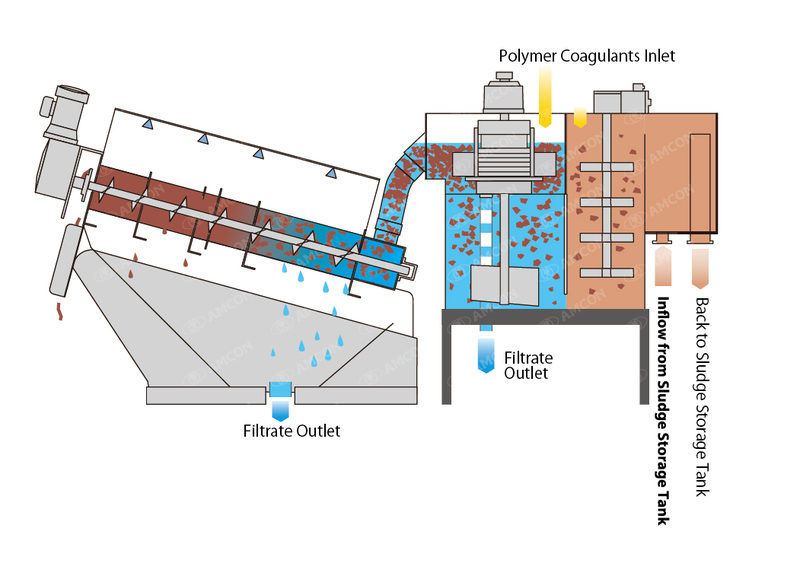 The model with a sludge conditioning tank realizes a high solid capture rate higher than 95%, and the efficiency of sludge treatment is tremendously enhanced as the inlet sludge is always conditioned beforehand. In addition, when required, the conditioning tank can be used as a reactor tank for inorganic flocculant.